Get a professionally-designed label for your insurance agency in just minutes! 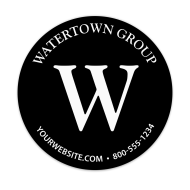 Just choose the sticker template that represents your agency best, and send us your logo and/or imprint information. Or choose one of our association branded stickers for IIABA, Trusted Choice, State Farm and Allstate. Don't see your associate? We will design one for you. Our pre-designed stickers are available in a variety of sizes, with classic and modern styles. Label all of your agency's mailings, policies, folders, packages and more. Enhance Your Agency's Brand Exposure: Label Everything! 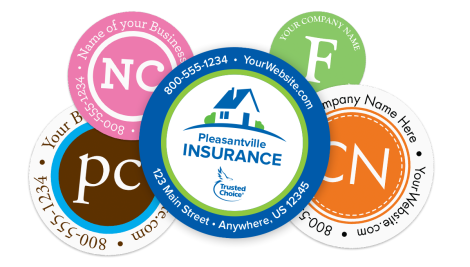 The Mines Press collection of designer stickers for insurance agencies has options that will satisfy all of your sticker and label printing needs. 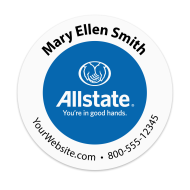 Our selection of association-branded stickers will allow you to print your agency's name and information alongside prestigious insurance brands such as, Trusted Choice, IIABA, State Farm and Allstate. We have the capability of creating any design, so if you don't see your association, simply contact us and we'll design the label for you. Our "Don't Text & Drive” stickers are also a great option. They will associate your agency to a great cause, while sending a message that will show clients and prospects that your insurance agency is doing its part. 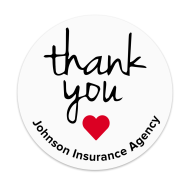 Use our "thank you" stickers to show your appreciation, either for doing business with you or for providing referrals and generating new opportunities for your agency. 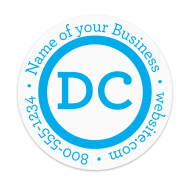 Use our modern business sticker designs with trendy monograms and initials to give new life to an existing promotional campaign that is losing steam. They will give a sophisticated and finished look to all of your packages, mailings, folders, policies, handouts, and more! Find the stickers that best fit your agency and display your brand everywhere. Easy to order – 100% Satisfaction Guaranteed!